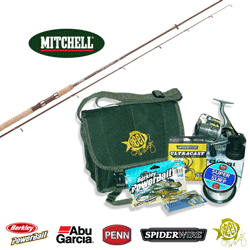 We have put together a complete outfit tailormade for the angler to start bass fishing. we can even fill the reels if you want us to, but you'll have to cast out. Abu Garcia Cardinal 106R is a credit to abu garcia engineering quality, but manufactured using slightly cheaper components, although a keen eye would find it hard to spot. Similar to the 500 series it has a lightweight body, aluminium machined handle, vented spool and a spare spool to boot! perfect size reel for Bass, Salmon,Seatrout, Pike, Barbel . Spinning , Legering, Feeder Spinning. Grauvell Maxilon is one of the strongest, smoothest, most durable braids on the market today. The way this stuff flows through the rod guides, you'll be casting farther and making longer pitches instantly. Amazingly thin and sensitive, with zero stretch. And with 21% stronger knot and straight breaking strength than the leading competition, they had to call it the ultimate braid! The Wedge - 28g(1oz) cracking lure for Bass, Pollack & other predatory fish, can be used on its own or on the end of a set of feathers to add extra deadly attraction. lures and line may differ from those pictured, depending on availability at the time of ordering. FREE Delivery on all Reel Fishing Bass Rod and Reel Deals over £100!! !